Ubisoft certainly seems to be a well-informed bugger, if nothing else. During its FY13 presentation yesterday, the company revealed – alongside its earnings for the 2013 fiscal year – a compilation of the top 20 franchises from 2005 to 2012, taking into account international sales for PC, PS3, Wii and Xbox 360 but ignoring all handhelds. As expected, Call of Duty topped the list with Mario and FIFA hot on its heels. Other big-name brands featured on the list include Assassin’s Creed (#5), Guitar Hero (#6), Need for Speed (#10), and Just Dance (#12). Curiously enough, Mario Kart Wii sits independently on the list at number #14, though that may be a tribute to its abnormally strong sales in relation to the Mario franchise. Of the franchises present, only two are owned by Ubisoft – Assassin’s Creed and Just Dance. 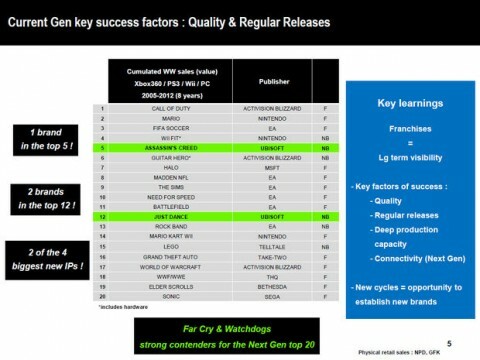 This seems to indicate that, while Ubisoft certainly has some powerhouse franchises, they need to be nurtured and promoted effectively to get on next year’s list. The list also indicates that EA dominates the list with six entries, ranging from Rock Band to Battlefield to the aforementioned FIFA. Meanwhile, Microsoft, Traveller’s Tales, Take-Two, THQ, Bethesda, and SEGA each have one entry on the list, and Nintendo managed to get two. Ultimately, this list serves as a checklist for developers and publishers to determine what markets hold the most potential for profit and what ideas should be expanded upon. It also feels like a reminder that Ubisoft does think about the future, and that their plans go beyond what’s working right now. With luck, this is a promise of good things to come in 2013.